Sam (Kelly Monaco) tried to encouraged Jason (Steve Burton) to make peace with Drew (Billy Miller), insisting they should be able to help each other. Jason thought it be better he’d keep his distance from Drew as they can barely stand to be in the same room with each other. Sam reminded that was in the past when Drew was focused on her but now they are divorced and he has other things on his mind. Drew reminded Kim (Tamara Braun) it wasn’t right to keep such a huge secret from their son. Dr. Terry Randolph entered to discuss Oscar’s (Garren Stitt) condition and told Kim and Drew they had some decisions to make about their son. When confronted by Cameron (Will Lipton), Oscar insisted he didn’t have cancer. 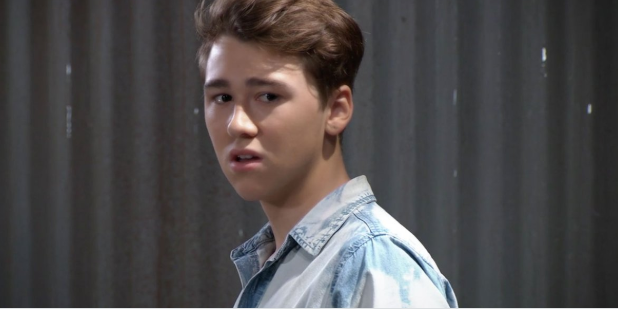 After Oscar left, Josslyn questioned Cameron about what made Oscar leave. Cameron gave Josslyn a story about Oscar wanting to take her on a hike. Then, Joss asked her Carly how to tell if you are in love. Margaux (Elizabeth Hendrickson) told Sonny (Maurice Benard) that Vincent Marino was her father and worked for Joe Scully same as Sonny. The D.A. thought Mike (Max Gail) was protecting Sonny because he loved his son but reminded she loved her father and would get justice for him. After Sonny left, Jordan (Briana Henry) questioned Margaux about not revealing Vincent Marino was her father when the ID was first made. Carly (Laura Wright) accused Elizabeth (Rebecca Herbst) of making false accusations that Josslyn (Eded McCoy) was responsible for Cameron’s shoplifting and warned she’d flatten Ms. Webber if Liz did anything to hurt Josslyn’s feelings. Terry discussed treatment options for their son with Kim and Drew, including a clinical trial. Suddenly, Oscar burst in and asked Kim whether it was true he had cancer. Terry left after Drew told Oscar he (Drew) and his mother (Kim) would answer his questions. Kim admitted Oscar had cancer. Sam found Curtis (Donnell Turner) at The Metro Court and asked him to be there for Drew. Sonny questioned Mike about what he did with the gun after he removed the body in Croton. Cameron overheard Franco talking with Elizabeth on the phone about being about with Dr. Randolph and learned she was a pediatric oncologist. Oscar asked his parents whether he was going to die. Margaux realized Mike could be covering for Sonny because his son killed her father. Sonny told Jason that Vincent Marino was Joe Scully’s lawyer and was also Margaux Dawson’s father. “This D.A.’s not going to stop until she takes me down,” Sonny told Jason. Jason (Steve Burton) came to Sonny’s (Maurice Benard) house and told her what happened when Sonny was questioned by D.A. Margaux Dawson (Elizabeth Hendrickson) about the body and gun and revealed to Carly that Vincent Marino was Joe Scully’s lawyer and was Margaux’s father. Jordan (Briana Henry) met with Stella (Vernee Watson) at The Metro Court in an attempt to make amends with Curtis’ (Donnell Turner) aunt but they ended up rehashing their bad history. Kim (Tamara Braun) sadly told Oscar (Garren Stitt) that his cancer could be fatal. 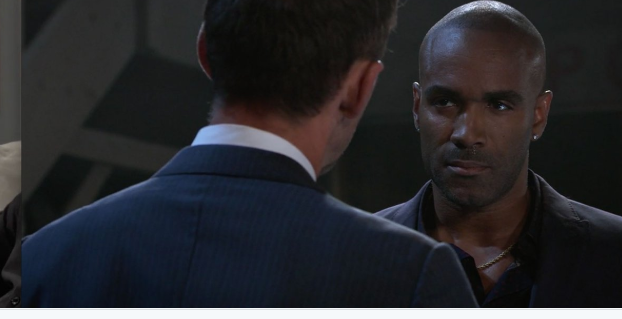 Brad (Parry Shen) told Julian (William deVry) about the baby’s heart condition and his worry that the truth could come out about how they got Wiley and asked for Julian’s help. At Charlie’s Pub, Nina (Michelle Stafford) had dinner with Charlotte (Scarlett Fernandez) and told the little girl that she (Nina) would no longer be living with she and her papa. Valentin (James Patrick Stuart) met with Curtis on the docks and Ashford was insistent on telling Nina the truth about the search for her daughter. Curtis arrived at The Metro Court as Stella was leaving. His aunt told him she wouldn’t be attending his wedding. He assured Jordan his aunt could change her mind before they got married. Oscar was angry his mother knew for two years he had cancer but didn’t tell him. He also didn’t like his father knew as well and kept silent. Oscar angrily told his parents they betrayed him by not telling him he was living on borrowed time…he could never trust them again. When Michael (Chad Duell) arrived, Carly told him Wiley had the same heart condition as Michael did as a baby. She talked about how well Jason took care of him and made the decision for Michael to have the heart saving surgery. Julian encouraged Lucas not to say anything. Oscar stormed out and cried in the General Hospital elevator. Finn (Michael Easton) hid his father’s medical file when Anna’s came downstairs. They talked about their complicated relationships with her son and his father. Kim (Tamara Braun) and Drew (Billy Miller) were worried because they hadn’t heard from Oscar (Garren Stitt) since he stormed off. Josslyn (Eden McCoy) was also worried as she hadn’t seen Oscar. Cameron (Will Lipton) hinted that Oscar was sick and keeping it from her. Meanwhile, Oscar angrily looked at all the missed calls from his parents and was about to throw his cell phone into the water when Jason (Steve Burton) arrived on the pier and stopped him. Oscar asked his uncle whether he was looking for him but Jason was just looking out for a coffee shipment. After questioning Jason about what it was like to die, Oscar admitted he was dying. In order to help in the search for their son, Kim and Drew told Detective Chase (Josh Swickward) about Oscar running off after learning he had cancer. Kim called Josslyn to ask whether she’s seen Oscar. On the pier, Oscar insisted it was his life and his parents had no right to keep his illness from him. Jason reminded that when you are a parent you do anything in your power to protect them, adding that helping them (by calling them and letting them know he’s safe ill help him (Oscar). Taking Jason’s advice, Oscar called his mother who refused to tell Julian (William deVry) what was wrong with Oscar. Drew urged Julian to give Kim some space. Alexis expressed her concern to Sam (Kelly Monaco) about Kristina wasting her talents by working at Charlie’s then Alexis went to the pub and met with Brad (Parry Shen) telling him about the right’s of Wiley’s biological father. A young woman named Daisy (Kelsey Wang) handed out fliers at Charlie’s Pub about a concert. She gave one to Kristina (Lexi Ainsworth) who invited Alexis (Nancy Grahan) to join her. From his hiding place on the pier, Jason watched Oscar’s reunion with his parents then came to Sam’s place to talk with her. Kiki (Hayley Erin) told Griffin about a photo spread she was offered for a magazine but was unsure of whether to do it. He urged her to do it in order to be a voice for women and also encouraged her not to hide her beauty. They made plans to meet in half an hour at The Floating Rib. After Chase (Josh Swickward) told them the WSB had a lead on Obrecht (Kathleen Gati), Anna decided to search for her but wanted Finn (Michael Easton) to remain behind to keep an eye on her son. Lulu (Emme Rylan) interviewed Felicia (Kristina Wagner) about the Ryan Chamberlain Murders. Peter (Wes Ramsey) sought out Dr. Kevin Collins actually Ryan(Jon Lindstrom) and told him he was having trouble sleeping due to PTSD and asked to be given something to help him. Maxie (Kirsten Storms) overheard the exchange and expressed concern for Peter. He told her that it’d would be better if he kept his distance from her. Maxie realized that his words came from Lulu and later asked Mrs. Falconeri whether she told Peter to stay away from her. Lulu explained she was just trying to help Maxie because she knew how confused her friend was about her feelings for Peter. Jason (Steve Burton) came to Sam (Kelly Monaco) and admitted he knew about Oscar’s cancer and that Oscar was the one who told him. Sam thanked Jason for being there for Oscar and offering his nephew support. Griffin came to Anna; he felt lost without his job and the church. Anna urged him to take time to find out what matters to him. At The Floating Rib seeing the back of her head, Ryan mistook Ava (Maura West) for Felicia. Ava asked Franco (Roger Hogwarth) whether his doctor was self medicating. He wanted to spend some alone time with Felicia but Mac (John J. York) being there and Lucy kept getting in the way. Finn told Peter that Anna was going after Liesl in order to protect him (Peter). Peter called Anna and left a voice mail asking his mother to be careful. Maxie asked Peter whether he was worried Liesl would come after him again to kill him. Peter told Maxie to warn Nina (Michelle Stafford) in case Liesl was captured and decided to flip on Nina by naming her as her accomplice in the kidnapping. Ava shot daggers at Kiki when she entered The Floating Rib with Griffin. Jason assured Sam he never takes her for granted. The #GeneralHospital Week In Review I wrote for The Nerdy Girl Express.